Saturday September 15th from 10am to 12noon at the Methodist Church. 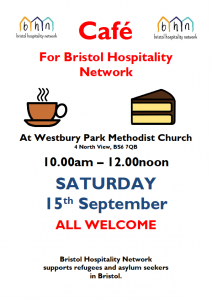 We are raising funds for Bristol Hospitality Network (they help refugees and asylum seekers in Bristol). Come along to enjoy homemade cakes, hot and cold drinks and good company. And afterwards go and check out the new Bookshop on North View opening on the same day!